DAVID CAMERON HAS said that any referendum on Scotland’s independence will have to be held in the next 18 months. The ruling Scottish National Party has hit back, accusing the Prime Minister of interfering in the process as it wants to hold the vote in the latter half of its term – most likely during 2014. Although some kind of referendum is likely to be held, the complexities of UK politics has made it unclear exactly how Scotland can decide its own fate. Cameron himself has pointed out that the Scottish people are yet to find out “when this question is going to be asked, what the question is going to be, who’s responsible for asking it” but that is just as much to do with Westminster as with Holyrood (where the Scottish parliament sits). The Downing Street cabinet is due to discuss proposals later today to give the Scottish government the power to hold a legally binding referendum. David Cameron has already said that legal clarity needs to be sought on who is responsible for the organisation of such a referendum. He told Sky News that it is still unclear whether it is Westminster or the Scottish Parliament who decides on such issues. Although a referendum can be held on Scottish independence (or any other topic of the government’s choosing), it may only hold advisory status if not backed by Westminster. Cameron is expected to tell Scotland that it can have a binding referendum – but only with certain conditions. Downing Street will probably say that only one question can be asked on the ballot paper and that it must be asked within the next 18 months. However, the SNP itself has confused the matter further with the Deputy First Minister Nicola Sturgeon stating that talk of a binding vote was unnecessary because UK referendums are always just “consultative and advisory”. Scottish First Minister Alex Salmond wants 2014 – maybe to garner yes votes out of sentimentality on the anniversary of Bannockburn (the decisive battle of the first war of independence ) – but Cameron believes that such a delay would be damaging to Scottish business as they will be asking are we in or out of the UK for the next two-and-a-half years? It is believed that Cameron will tell Salmond that if the referendum is held after the 18-month time limit then it will not be binding. The SNP has said it wants a simple yes/no referendum asking whether people wanted to leave the UK or not. However, others in Scotland want to be able to choose financial independence but not full political independence. It is unlikely Westminster would allow for any such vote, limiting the ballot to just one question – whether to leave the UK or not. Any further choice about greater devolution will not be backed by Cameron’s government. The BBC says that Westminster could offer Holyrood the legal power to set their own referendum conditions (date and form) but it could come with a deadline or a “sunset clause” meaning the powers would have to be used up within a certain timeframe. This is yet another decision for both parliaments. In England, the Electoral Commission oversees referendums but this would not necessarily be the case in Scotland. David Cameron is decidedly against Scotland breaking away from the UK so why demand an earlier vote then? Salmond wants time to build up a yes vote so Cameron may want to shorten this as he believes that the majority of Scottish people do not want a full separation from the UK. Salmond’s office has criticised the Conservative leader, stating Westminster should allow Scotland deliver the referendum in the timescale set out in their election campaign (meaning a 2014 referendum). According to the Guardian, there is another option open to the parliaments. An advisory referendum could be held within 18 months and if there is a yes vote, detailed negotiations on the terms of a separation could be hashed out and then put to the electorate in a binding vote. 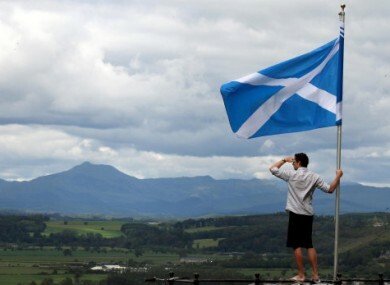 The latest polls have shown that there is still only a minority support for independence – but it is on the rise. December’s Scottish Social Attitudes Survey showed that 32 per cent of people would vote for a split (up nine points up on last year and at a six-year high). Currently Scotland’s is a devolved national administration meaning it has its own government which has powers on most matters except those reserved for the UK government run from Downing Street. The head of state continues to be the British monarch, namely Queen Elizabeth II. The SNP has claimed that independence will lead to a social union between Scotland and the rest of the UK rather than a political one. As members of the EU there would continue to be open borders, free trade and cooperation. Scotland would also likely keep the Queen (but they would call her the Queen of Scots). Email “Explainer: What's happening in Scotland?”. Feedback on “Explainer: What's happening in Scotland?”.